It was the 27th of Rajab and approximately around one year before his (saws) hijra (emigration) to Madinah. It distinguished between the era of rasulAllah (saws) living in Mecca and his hijra to Madinah. It came at a time when rasulAllah (saws) was severely being tested. He was being oppressed in Mecca as well as in al-Taif, looking for a safe place for the Muslims but instead driven out by being stoned and mistreated everyday. After it, the Prophet Mohammed (pbuh) decided to establish a home for the Muslims in Medina. It was the nocturnal miraculous journey called Isra wal Miraj that gave all Muslims the means to spiritually ascend. The Isra and Miraj clearly separated the believers from the hypocrites. It was very simple. The believers have imagination. The believers have faith. The believers know that anything is possible with the Will of the Almighty. A night journey worth a month’s travel that occurred only in an hour, not to mention a vertical ascent to the heavens to meet Allah gives no problem to believe for the one who has faith. You know, on his (saws) way back from this miraculous journey, Muhammad (saws) saw camel caravans that were heading towards the Hejaz. He reported their happenings before the caravans arrived to the people of the Hejaz and the people questioned the caravans when they came and found his report to be true, but most still did not believe. 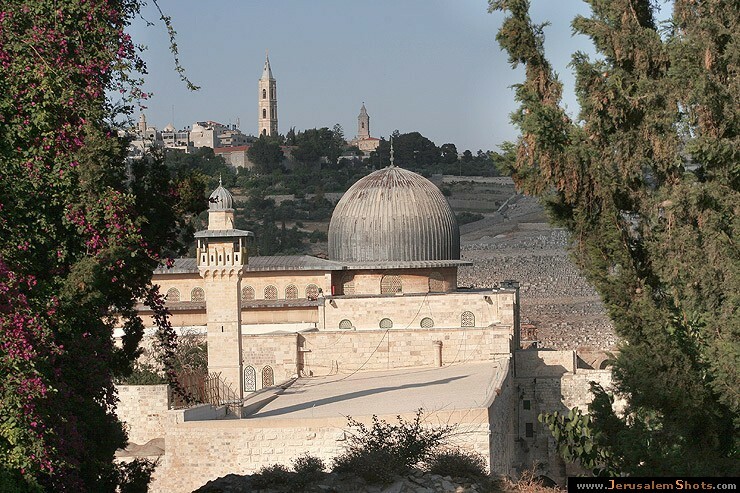 RasulAllah (saws) even described Jerusalem and Al Aqsa to the people who had been there and they attested that his description was true, but again, some people are deaf, dumb, and blind to the signs of Allah. The way I see it, people believe in all sorts of things. The tooth fairy. Santa Claus. Easter bunny. Oh, wait, only children believe in those? Okay, then. A football or basketball team. The speed of light. Stones. Statues. Superstition. Bad luck. Superman. People worship many things other than the Only One To Be Worshipped. Why then is it hard to believe that a man was transported quickly like the speed of light to meet his Lord? After all, Allah is The Light. And rasulAllah (saws) is mankind’s real superman. I am happy to see that there are some non-Muslims who have come to the brink of belief in this miraculous episode though. The miraj inspired Dante’s 14th century literary classic and epic poem, The Divine Comedy, which talks about the afterlife from the Christian perspective. There is no scholarly Roman Catholic household without this book. A Roman Catholic priest and Professor of Arabic, Miguel Asin of Spain, published a thesis that paralleled Islamic miraj hadiths with Dante’s work. It is called La Escatologia Musulmana en la Divina Comedia (1919). An abridged translation of his work can be found from Goodword Press, entitled Islam and the Divine Comedy (2002). At first, Miguel Asin suffered a lot of backlash from his own religious community for this work, but alhamdulillah, he did not back down from his beliefs. As written on the back of the book, “European Christians could not reconcile themselves to the thought of their most cherished religious poem being based on non-Christian sources […] The consensus of opinion of all eminent scholars of Europe and America is now in favour of Prof. Asin’s thesis.” I think Miguel Asin’s study is important to note for Christian-Muslim relations, showing that we have more in common than most think, but this is a digression from my main point. The miraj is a sign from Allah of how Powerful He is—Allah is not limited by time or space. Those are His creation. He enabled the Prophet (saws) to experience a miraculous journey that was not limited by time or space as we perceive them to be. Muhammed (pbuh) was transported from the Sacred Mosque (the Ka’aba) of Mecca to the Farthest Mosque (Al Aqsa) in Jerusalem. Al Aqsa is considered the farthest mosque because it was the westernmost mosque that the Muslims of the Prophet’s (saws) day knew about. This was the horizontal journey. But it was so much more than that. In the Isra and Miraj are many lessons. It was a view into the past and future for Muhammad (saws). Muhammad (saws), in a way, made pilgrimage and stopped and prayed at the sites where previous prophets were inspired on the horizontal journey. He also saw where he would emigrate to (Madinah). He saw the consequences of those who do not make their prayers, abstain from charity, commit adultery, hinder the path of others, eat usury, do not fulfill trusts, sow discord, backbite, slander, and gossip, and those who speak words that they can’t back up. He saw the Dajjal. He saw and heard Heaven and Hell. He saw the Column of Islam. He saw the pull of the dunya and the devil. He saw how much life this world has left to live. He met all of the prophets (peace be upon them all) and led them in prayer. Then he went on a vertical journey! He traveled every level of heaven and went where no other has gone before without being completely annihilated and burned—into the presence of the Divine Reality. He saw Him—the One, the Only, the Maker of all of us. He talked to Him. Subhanallah! And he brought us—you, me, and the Muslims past, present, and future—a gift from Him: the gift of salah. RasulAllah’s (saws) heart was cleansed before his embarking on this journey. He also bathed in Heaven before prostrating to Allah. This shows how important it is to guard our purity and chastity…our wudu. Muhammad (saws) prayed throughout the Isra and Miraj, as well as before it. He always used to pray in 2 rakat units even before the commandment of salah. How important is the prayer then! We should not delay it or miss it! There is no excuse! If we do deliberately miss our prayers without just cause, then surely, we must admit to ourselves that we are worshiping something other than The Only One Worthy of Being Worshipped. Salah is the mark of Muslims and the pillar of our deen. It is the first thing that we will be called to account for when we are judged. It is the means for us to draw near to Allah and the key to our salvation. Each prayer is rewarded ten times over inshAllah, just as if we were making the original fifty prayers requested of us. When we make sujud, it is in humble submission and surrender to our Lord, our Maker and Sustainer. We put the noblest part of our bodies as men and women of understanding on the floor, surrendering our free will-intellect-mind-personality to the Will of Allah. The salah is the ladder by which we make our miraj. It is our buraq, our noble steed, to help us get near to Allah, which all the prophets (peace be upon them all) rode before. What a blessed night tonight is! It’s the anniversary of the Isra and Miraj, as well as Thursday night, meaning that is the beginning of Friday in which there is great blessing in reading Sura Al-Kahf. The holy month of Rajab is ending, and Ramadan is basically one month away. Let us not think of our salah as a burden, but as a relief—the coolness to our eyes as it was to rasulAllah (saws). May you enjoy your miraj tonight and forever inshAllah in your prayers. Amin. NOTE: To read the entire story of the night journey, check out this website that brings together all of the hadith concerning Isra wal Miraj. It’s long, but worth the read. I guarantee you’ll be inspired insh’Allah. “The salah is the ladder by which we make our miraj.” yes yes yes yes…I love this! Mashallah. Very well written and shared. May Allah reward you abundantly for this. now i understand the meaning of the hadith shari in which our beloved prohet muhammad (saws) said that if u come to know the penalty of crossing infront of a person saying his prayers,u would wait ur entire life waiting…….